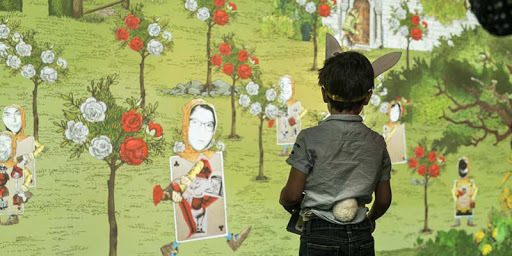 Colourful, quirky and unabashedly indie, the Illustration Arts Fest (IAF) returns to LASALLE McNally Campus this coming weekend on 22 and 23 September. The Organisation of Illustrators Council (OIC) put the show together for the first time in 2016. This will be the 3rd anniversary of the show, and it is already one of Red Dot Diva's favourite annual art event. Here are 5 Reasons Why You Should Come To This Year's IAF too! The Artists Market at Illustration Arts Fest is the best thing ever. It is busy, inventive and vibrant. With over 100 indie artists and illustrators from Red Dot Island and nearby countries taking part, no wonder it's a crowd puller. Red Dot Diva recommends those who visit IAF to check out the booths by her friends and acquaintances, like Jessica Emmett, Inky Cat Studio, The Rolling Ronins (with Wayne Rée & Rex Regrets), Danger Gene, toy designers Daniel Yu and Ziqi Wu, and not forgetting, the comic creators from COSHStudios. 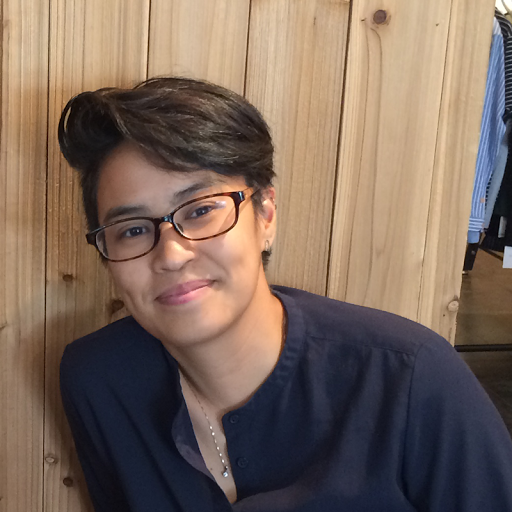 The art style is wide ranging and eclectic, as the list of artists include the popular Muffinsaurus, artists Billy Yong and Zu Orzu, Fingersmith Letter Press who specializes in illustration and hand lettering, Inez Design with embroidery art and Rakasa Print Studio from Malaysia who does silkscreen art. 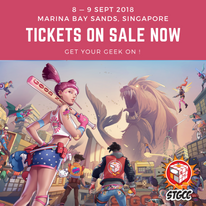 For the past few years, Red Dot Diva has introduced artists and creators who will be showcasing their artwork at the STGCC (Singapore Toy Game and Comic Convention) Artist Alley. This section of the show is where the local and region's creative heart beats, producing all kinds of interesting art, craft and merchandise. There is something special for cat lovers at this year's Artist Alley. Look out for Inky Cat Studio, whose main subject consists of felines, illustrated in adorably quirky ways and scenarios. If you are not that into cats, Inky Cat Studio is very versatile, and also produces cute images of bears, rabbits, raccoons, as well as more traditional subjects like human portraits. 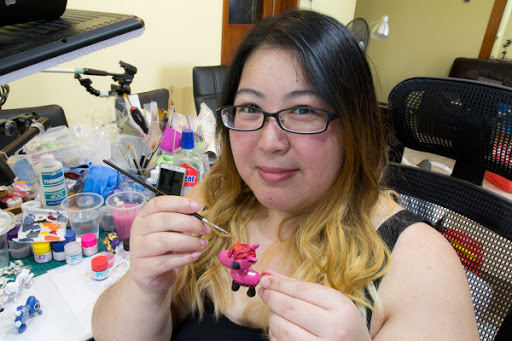 In this interview, Red Dot Diva talks to Stephanie Hew, the lady behind Inky Cat Studio, about her art style and artistic influences. Red Dot Diva: Hi Stephanie! Please tell the RDD readers a little about yourself, how you got into the career of illustration and graphic design. Stephanie: Hi everyone! 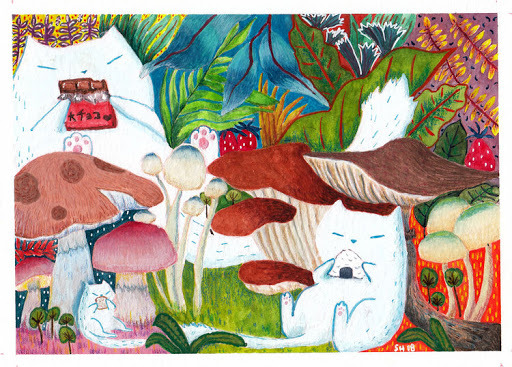 I’m Stephanie Hew, the illustrator behind Inky Cat Studio :) I’m an Australian living here in Singapore with my husband and 2 cats. I’ve always been creative and loved technology since I was very young. 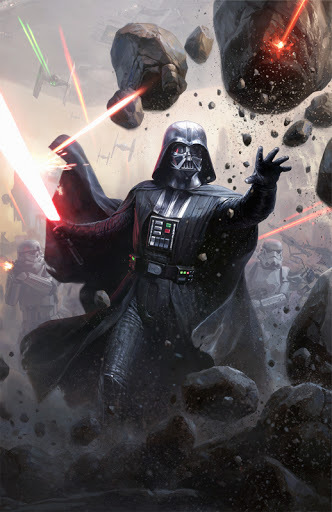 I started with traditional media like oils and watercolor and then when I got my first computer I discovered the world of digital art and kept on teaching myself the software and techniques. This was all happening on the side while my full time job for many years was in higher education. After a few years in Singapore however, I decided it was time for a change and to take my long time passion seriously and see where it could take me. It was a difficult decision but with the encouragement from family I made the leap and started Inky Cat Studio. Last week's Japan Park SG exhibition was quite the cultural fest on all things Japanese. In particular, Red Dot Diva thought the events held on the Omakaze Stage was very engaging. The schedule of stage events ran the gamut of talks with cosplayers, wrestler Jushin Thunder Liger, robotist Professor Tomotaka Takahashi, various types of traditional dances, a party with girl band Poppin'Party as well as veteran rockers Sunplaza Nakano Kun & Papala Kawai. 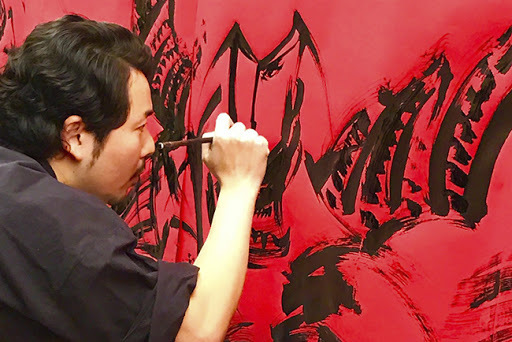 However, Red Dot Diva's favourite performance on stage was the live drawing of samurai sumi-e art (Japanese black ink brush painting) by OKAZU, a talented artist who hails from Osaka. OKAZU is well-known for his sumi-e art on historical samurai and warriors, but he also does fantastic artwork of characters from manga, anime, Western pop-culture, and even comic book superheroes! On stage during the Japan Park SG show, in less than 30 minutes, OKAZU created striking warring samurai images that seem almost alive, as if they are to jump through the white canvases. Accompanied by a cinematic soundtrack, his live performances were both elegant and visually powerful. 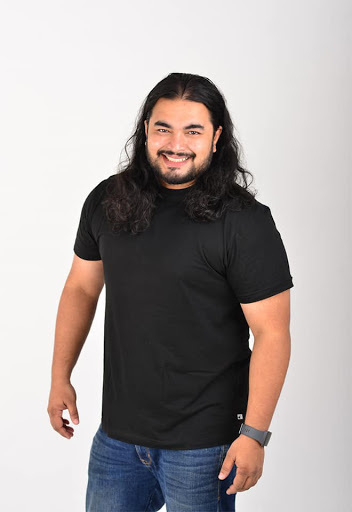 Red Dot Diva had a chance to interview OKAZU at the Samurai Room on the 2nd day of the show, and learned more about his motivations and inspirations. OK, OK. Red Dot Diva has to confess. She cannot get enough of Reylo. 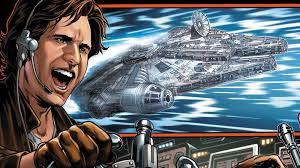 For the uninitiated, that's the ship name for Rey and Kylo Ren - the two characters from the latest Star Wars trilogy who represent the Light Side and Dark Side of the Force. Their fateful bond and intertwining destinies have spurred the imagination of fans who dare (or dare not) hope for their romantic relationship to succeed. Who else other than Rey is able call Kylo by his real name Ben, without having him visibly scowl and flinch? A deluge of Reylo fanart has been flooding social media since then, and many of them have been either tragically angsty, gleefully humourous, or simply beautifully rendered. 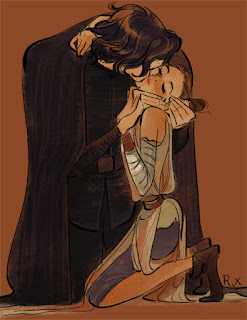 To keep the flame of Reylo going, Red Dot Diva will be putting up a blog series on selected artists who have produced some of the popular Reylo fan art in social media. 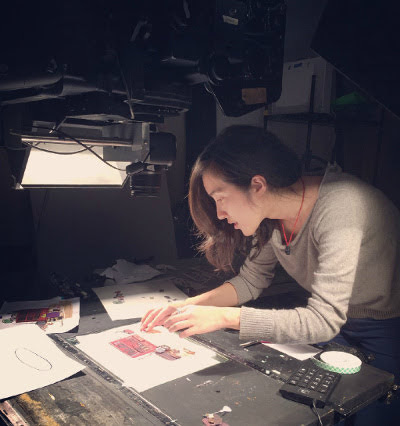 The first in the series is an interview with USC animation department graduate, Rachel Xin. Rachel hails from China, and before studying in USC, she was a graduate of Beijing Film Academy, majoring in Animation. She has also recently finished a freelance job at Warner Bros as a character designer. Her passion is drawing (obviously! ), and she enjoys watching movies and travelling. One just needs to take a peek at Rachel's website and social media timeline to see that her fluid, almost Chinese brush-like artistic style is obviously East Asian. 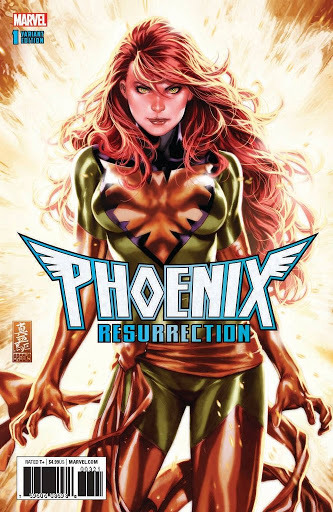 Other hints include the posture and facial expression of the characters in her art. These translate so well in her Reylo art, as Chinese love stories are usually quite tragic, and Rachel skillfully infuses that sentiment with Western pop-culture with nuanced details that are familiar to Asian fans. It is amazing how Rachel is able to conceptualize and make these static images stick in one's visual memory. Judging by her artwork and content, Red Dot Diva is sure Rachel will go far. So, she got in touch with Rachel to find out more about her art style, her thoughts on Reylo, and her aspirations. 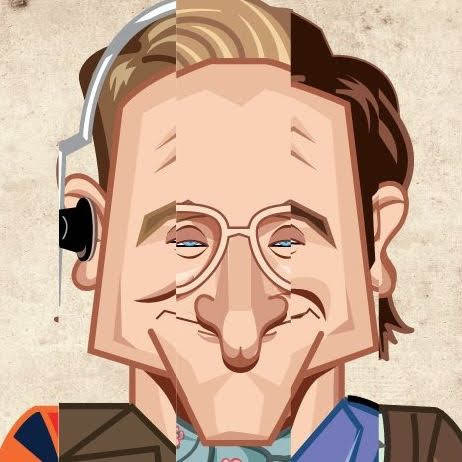 Red Dot Diva: How did you get into art/ illustration and animation? Rachel: I have been fond of drawing since I was a kid. The white wall in my house was painted to a mess by me. The good thing was that my parents never blamed me for that. Instead, they sent me to various interest classes, like piano, dancing, calligraphy and drawing. For a 4-year-old, these classes were pretty heavy, so I found all kinds of excuses to skip the classes. I pretended to be sick to avoid practicing piano, but I never gave up on art! From that time I knew I probably would draw for the rest of my life! I love drawing manga, watching animation and movies. I love telling stories. My parents had always been supporting me with the attitude of “do what you like”, so naturally, I chose a high school which specializes in fine arts. I went to the best film school in China to learn animation, and after that I chose to further my study in the U.S.! Grand sweeping landscapes, massive battle scenes and memorable dramatic visuals are mainstays of HBO's award-winning fantasy drama series "Game of Thrones". However, to promote upcoming Season 7 of "Game of Thrones", fans are invited to view their beloved TV show in a much smaller scale. An epicly miniscule scale, to be exact. Together with art studio and curatorial space K+, HBO Asia commissioned microsculptor Salavat Fidai to carve 16 pieces of various images from the show, all on the tips of fragile graphite lead pencils. 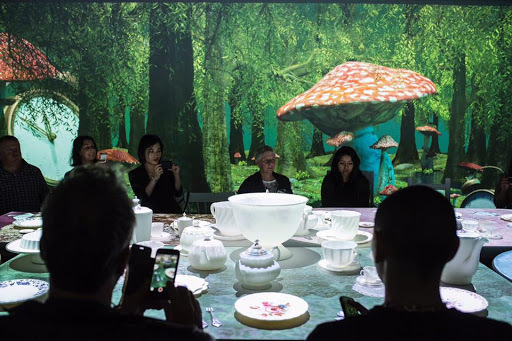 The entire exhibit took 4 months for the Russian artist to complete. 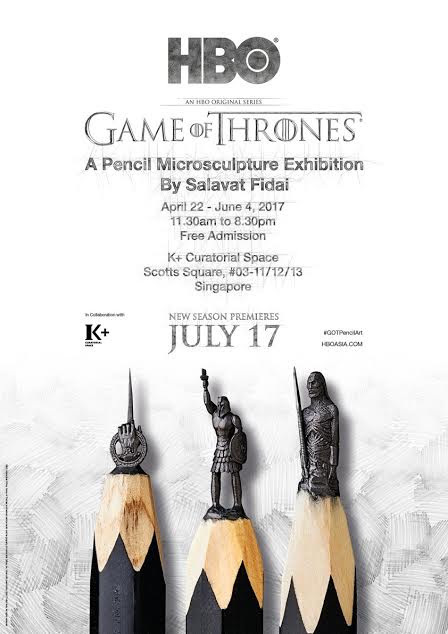 The result is a special exhibition called "Game of Thrones: A Pencil Microsculpture Exhibition by Salavat Fidai", held at K+ Scotts Square till June 4, and admission is FREE! There have been art exhibitions hosted by game publishing company Ubisoft Singapore before, but the latest edition curated and designed by WY-TO, is the best one yet. "The Art Behind the Game - The Ubisoft Experience" held at the National Design Centre, focuses on the Assassin's Creed franchise, which has sold over 100 million copies worldwide. One of the biggest selling game franchises of all time, Assassin's Creed offers its fans opportunities to take the "leap of faith" and fight for freedom. The exhibition is held in partnership with DesignSingapore Council, as part of VOILAH! French Festival 2017. This year's VOILAH! festival's theme is about imagination and innovation, and the eye-catching Ubisoft event encapsulates these ideas perfectly. HBO's insanely popular TV series "Game of Thrones" is known for portraying scenes on a grand majestic scale. As Season 7 is set to return to our screens on 17 July 2017, the battle for the Iron Throne is expected to get more intense. 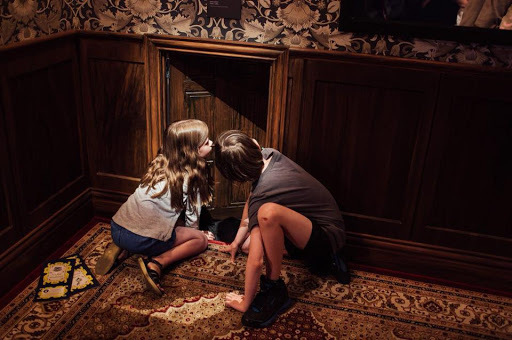 However, to promote the upcoming new season, HBO Asia is offering fans a chance to view Westeros in a whole different level - a very tiny level to be exact. The company has specially commissioned Russian artist/ sculptor Salavat Fidai to carve a series of microsculptures on the tips of graphic pencil leads! 16 of these astoundingly intricate carvings will be on display at K+ Curatorial Space this coming weekend till 4 June, and it is free to attend! The sculptures include iconic images like the White Walker, Hand of the King, various different house sigils, Drogon, Three-Eyed Raven, the Oathkeeper and more! Red Dot Diva has covered local creative events for a few years now. In the last couple of years, she noticed that the indie art scene in Red Dot Island has become even more vibrant. Generally speaking, there is now a bolder level of confidence emanating from artists and creators, as a newer generation seeks to consume a wider range of topics and forms of expression that resonate with their sense of being. So, it is a great time for the Illustration Arts Fest (IAF) to make its debut this year. 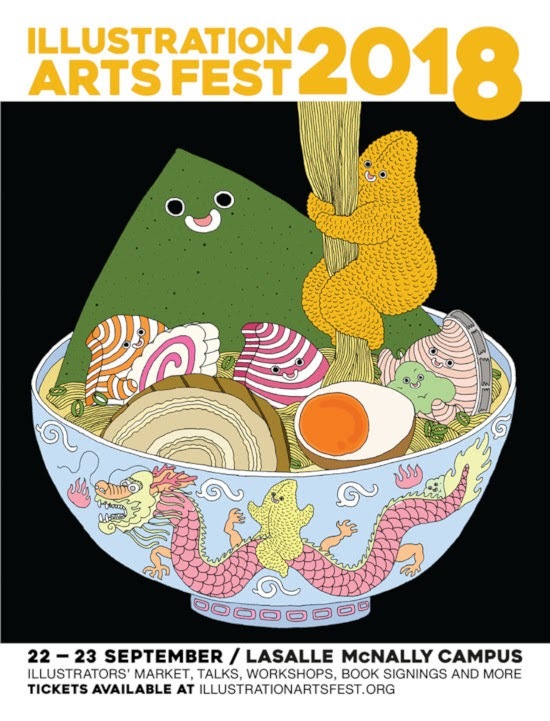 Organized by the Organisation of Illustrators Council (OIC Singapore) in celebration of its 10th anniversary, the festival will be held in two locations (LASALLE and at SWF/ The Arts House) over two weekends - 28 to 30 October, and 4 to 6 November. STGCC 2016: More Unicornos and Skullhead Samurai on the Toy Front! The Glam Bloggers Alliance pal Ed from Toys-etc is shimmering with glee about another tokidoki Unicorno variant by toy designer Jason Freeney and Skullhead Samurai by Jon Paul Kaiser. 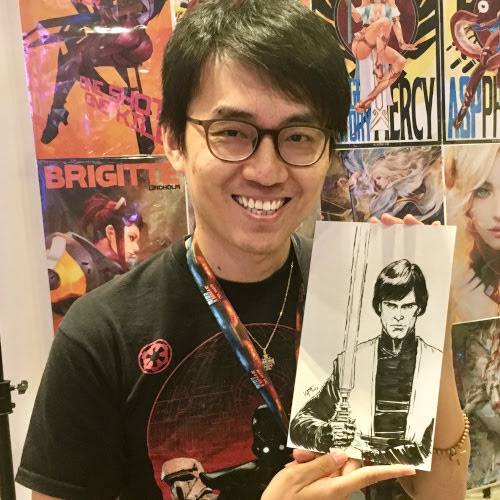 Jason Freeney was a guest at last year's STGCC, and he will be returning to the show again this September. Thanks to his host MightyJaxx (booth H3) & Pobber (booth AA83 & AA85)! The art collectible makers are also bringing back Huck Gee to the convention. It is wonderful that Huck Gee has decided to return to Red Dot Island, especially after the unfortunate incident where someone stole his precious prototype at last year's show. Stellina is one of the very first Unicornos and was featured in Series 1 (and also in the upcoming Metallico Series) and prominently in many of LeSportSac x tokidoki bags. 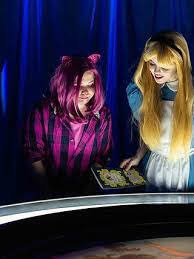 Here, it gets Jason Freeny's withering touch and well, you won't be finding stars and rainbows inside. I'm thinking aloud but who else would want to see the entire Series 1 XXRayed and released blindboxed? No matter how ugly one half the unicorn is, there's nothing like pulling a Prima Donna. Yes. I am obsessed. MightJaxx. You will find me stalking you. 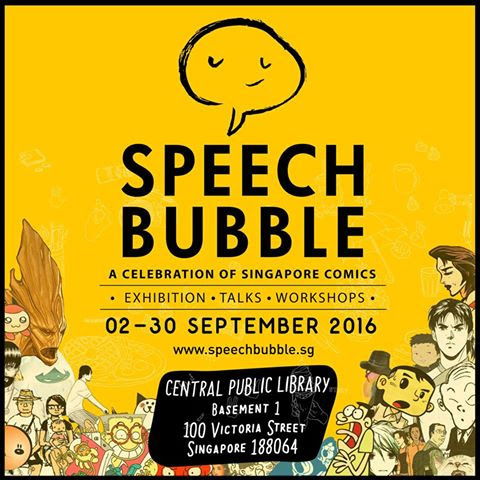 Next month, the Red Dot Island comics scene will be given the spotlight in a special almost month-long event called Speech Bubble held at Basement 1 of the National Library, from 2 to 30 September. 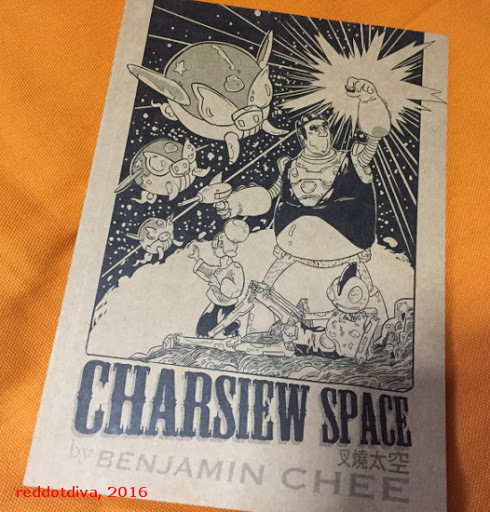 Organized by media company Potato Productions and local comic book artist Sonny Liew. Sonny has also been in the spotlight in recent times, mainly due to the accolades he received for his brilliant brainchild, "The Art of Charlie Chan Hock Chye". "The Art of Charlie Chan Hock Chye" won the Singapore Literature Prize for fiction this year - the first graphic novel to receive such a recognition! Speech Bubble event consists of an exhibition of original works, books and comics-related collectors items, like those by featured artists Johnny Lau, who is best known for the iconic Mr Kiasu comic series, and pioneer Malaysian artist Nora Abdullah, who published her first comic called "Cik Siti Wan Kembang" in 1955. 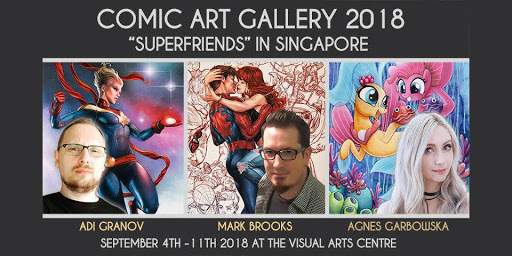 Other creative works on display include those by Sonny Liew, Eric Khoo, Troy Chin, Otto Fong, Koh Hong Teng, Colin Goh, Gary Zhu, Cheah Sinann and many, many more!